Having enjoyed a staycation this past weekend, in one of the most luxurious homes I’ve ever visited, I was totally inspired to revamp my room! I took these photos from a beautiful home in the hills that we stayed in that was elegant and clean with its crisp whites and pops of color! Stay with me here, if you’re ready to flee from the pom poms, stick around because it’s a jungle in here, literally! 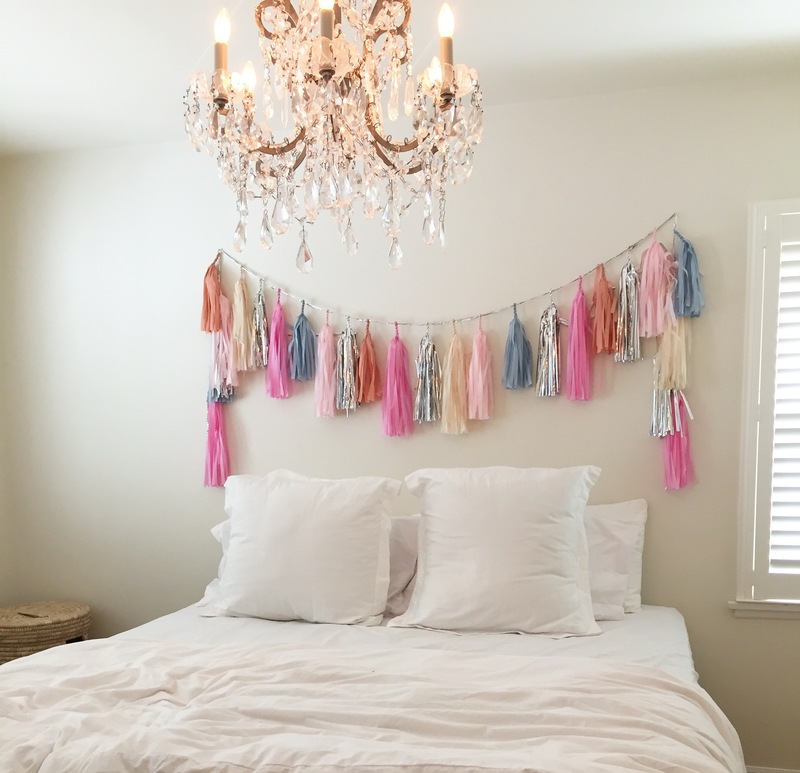 I really love this string of pom poms above this simple bed, the chandelier above, and the all that natural light coming through! It was a YouTuber’s dream to film in here … ahem no lights necessary, there was so much light coming through both corners of the room! Filming a vlog was the first thing I thought of when I saw this set up, “Yes I can sit there and face that way”. Also, those prints you see on the bed spread, that would be from puppy Luna thinking she owns the place! She galloped (she runs like a baby horse) from room to room and jumped on all of the beds. All of them. This was one of the 4 bedrooms in the house, and my personal favorite! I called it the Princess Room because that’s what it felt like to me, a doll-house princess room, so pretty and dainty. The second room I’ll feature was Corrine’s favorite! We called it the Jungle Room because the walls were covered with giant leaves and the green hue was so beautiful, I wish I could’ve really captured it’s true tone! Again with the simple, clean, white bedspread and sheets, I love the choice here because it doesn’t take away from how busy, yet fun, the walls are. A simple lamp in the corner, two windows allowing for the day to peak through, and this beautiful set up on the far wall – we were in love I tell ya. Why yes, that is my phone just candidly hanging out on the bamboo table. I had forgotten where it was until I saw this photo and remembered I’d put it down here. Lavender stems in vases sprinkled around the house was the most inviting and fragrant aroma you could imagine. 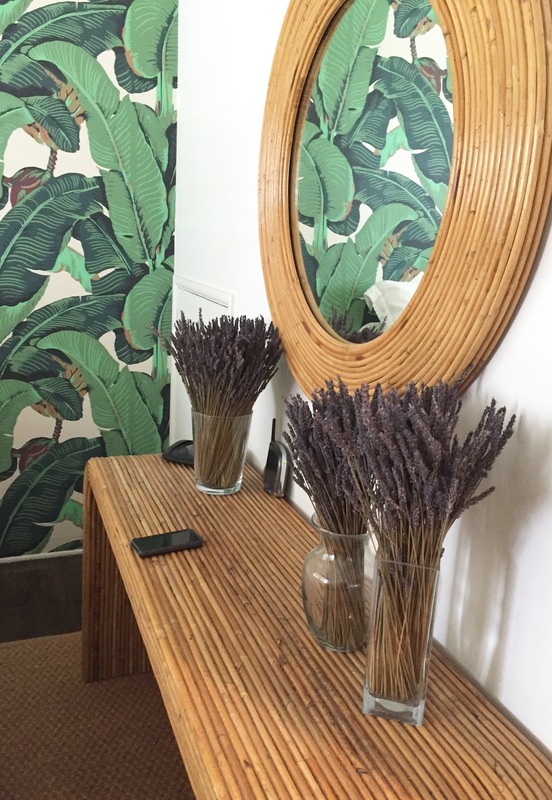 Again, the decor is simple, but I love simplicity, I love the bamboo themed furniture, and I love how it fit so perfectly with the painted walls. The rest of the home was just as beautifully decorated as these two rooms, people were bustling about so I wasn’t able to capture the home room by room. It has however inspired me to focus on being more simplistic in my decor choices, more open to big prints and bright colors, and to let light be the focus of each room. I really loved it here and I loved how inspired we were when we left. I actually ordered some pom pom wall hangings of my own and a new white duvet cover in honor of these rooms! One room at a time, one space at time, that’s what I keep telling myself. I think it’s easy to get overwhelmed by decorating, by theming a room or picking colors. It’s especially difficult when you have zero clue what you’re doing … me! I like to think that once my bedroom is complete, I’ll migrate into the living room and redecorate the space in there. Baby steps … if I can do it, trust me, you can too! Pick a space in your home, start small, and surround it with things that make you feel less anxious and more relaxed. That’s exactly how I felt when I walked into this house. 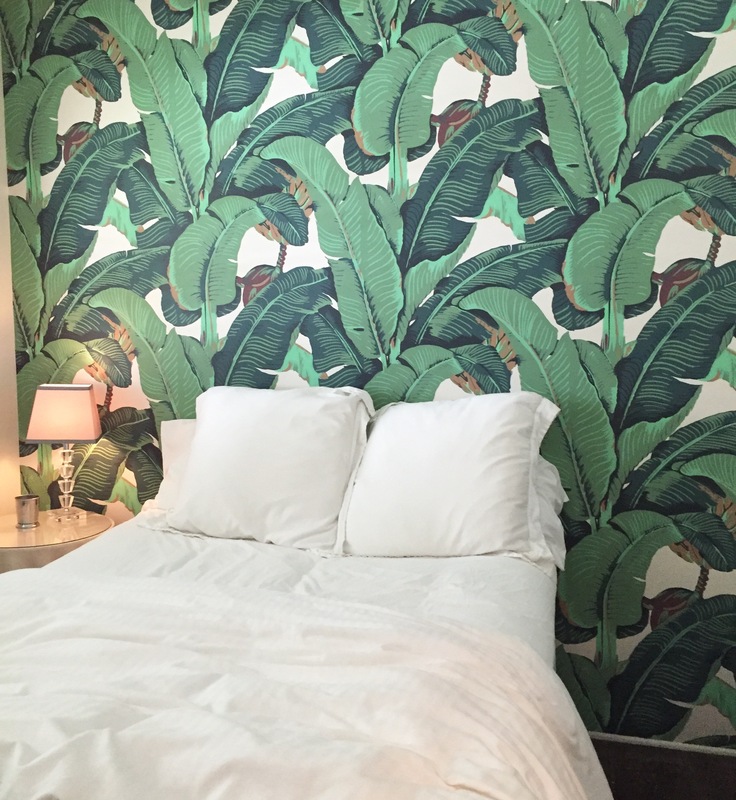 I hope this inspired you to get thinking about Spring decor and what colors you’re drawn to. I know that I’m really loving this white out look! What kinds of colors or prints are you most drawn to, and are you more of a decor person or a wall and accessory person? See you next week with some more happenings and have a wonderful weekend!